Formulated to cleanse toxins from your urine, blood and saliva! If you need to clean your body of Methamphetamine, then this specially formulated detox kit is for you. No matter what your situation we have a kit that will work for you. 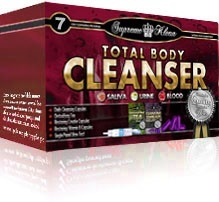 This Total Body Cleanser kit comes complete with everything you need to get clean and stay clean. Plus, there is no need to worry because this product is a powerful and permanent cleanser and is not a masking agent like some other products. Because these programs are permanent cleansers they leave no remains of toxins after the program's end. These detox programs are extremely effective against all sorts of toxins. This detox program contains packets of capsules, which contain six capsules in each packet. Our Supreme Klean cleansing capsules you take daily with your meals. Also included is an herbal cleansing tea formulated to act as a powerful detoxifier, as extra insurance or as an extra boost for the capsules, just because everyone's body is different. A diet menu suggesting how to plan your diet during the program in order to achieve the best possible results. Creatine and Vitamin B capsules to restore to their normal levels of Creatine and Ph. All of our Total Body Cleanser packages come with your choice of a FREE single panel drug test so you can test yourself and be sure that the program has worked and that your body is clean.